Machine Age – New England's Largest Selection of Mid-20th Century Modern Furniture | Large Brass Table Lamp with Multiple Globes in the Style of the Laurel Lamp Co.
Large Brass Table Lamp with Multiple Globes in the Style of the Laurel Lamp Co. This large table lamp adds a striking note to a range of settings. 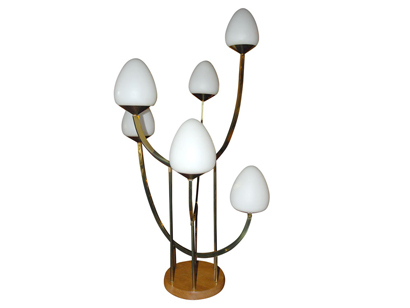 Reminiscent of the work of the Laurel Lamp Company, it features six frosted white glass acorn globes staggered on curved brass frames set on a wooden base.